Ready for something a little spicy today, Boys? I know a LOT of fellas that don’t think their meal is complete without a little shake-shake of their favorite hot sauce. And while we all have our favorites, Tobasco does seem to be the Granddaddy of them all, yes? I think this is a really adorable cake. I’m always slightly amused by sweet cake that’s shaped to resemble something that it won’t possibly taste like. 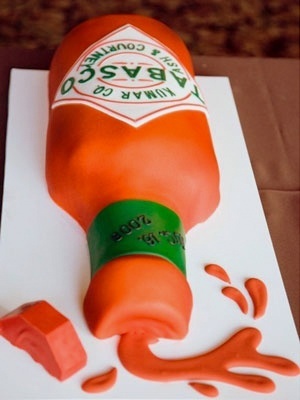 But then again, maybe they managed to add some Tobasco to the filling. What do y’all think? Chocolate-Tobasco buttercream? Any takers? We spied this darling cake on Pinterest, but it was originally featured on TheKnot.com. We aren’t sure who created the flawless confection, so pipe up and let us know if you know in comments!